Olympic gold medal winning 470 teams, Hannah Mills/Saskia Clark (GBR) and Sime Fantela/Igor Marenic (CRO) are confirmd on the shortlist for the Rolex World Sailor of the Year Awards. Today, 3 October 2016, World Sailing has announced the shorlist of nominees for the 2016 Rolex World Sailor of the Year Awards. Peter Burling and Blair Tuke are the undisputed kings of the 49er, raising the bar to unrivalled realms. Rightly labelled sailing's hottest properties, Burling and Tuke dominated the 49er fleet at the Rio 2016 Olympic Games, winning with two races to spare but their dominance of the Men's Skiff began long before the first starting gun in Rio de Janeiro. Over the Rio 2016 quadrennial the pair personified perfection, winning four consecutive world championship titles and every major event along the way. The only dent in a near perfect repertoire was bronze at the South American Championships immediately before Rio 2016 but they did not let that distract as they clinched Olympic gold with a cool confidence. As if their Olympic campaign was not enough to occupy the New Zealanders, they have combined sailing the 49er with senior roles at Emirates Team New Zealand in the America's Cup World Series, spearheading the team's success. Santiago Lange provided Rio 2016 with the fairy tale storyline of the Olympic Games as he won gold with Cecilia Carranza Saroli in the Nacra 17. At 54-years-old, Lange was the oldest sailor competing but his story goes beyond his age. Just one year prior to Rio 2016 Lange was diagnosed with cancer and had to have a lung removed. Taking the fight head on, Lange worked to regain a basic level of fitness before tackling the rigours of sailing the physical Mixed Multihull. Making the start line in itself was an achievement for the resilient Argentinean but with two Olympic bronze medals behind him, his sons competing in the 49er and the support of a nation urging their sailors forward, Lange and Carranza Saroli showed what was possible when you work together. Leading into the Medal Race, the Argentineans survived two penalties and came home in sixth place. Enough to see them clinch gold by a single point and write their names into the history books. At Rio 2016 Giles Scott stepped out of the shadow of Sir Ben Ainslie, one of the greatest ever Olympic sailors, excelling to realms that not even Ainslie himself had managed. An undisputed favourite heading into Rio 2016, having won 16 of 17 events sailed at, Scott stamped his authority and unlike Ainslie, won gold ahead of the final race. Crossing the finish line as an Olympic gold medallist saw Scott, the usually reserved, tame, gentle giant come out of his shell, revealing a passionate character brimming with pride and emotion. Scott boasts key victories throughout the nomination period including two Finn Gold Cup victories as well as a pre-Rio victory on his home waters at Sailing World Cup Weymouth and Portland. In addition, Scott has been an integral part to the Land Rover BAR America's Cup Team during the nomination period. Always with a smile on his face, Damien Seguin of France is one of the most inspiring Paralympic sailors around, constantly giving his time and efforts to support and showcase the sport he holds close to his heart. With Athens Paralympic gold and Beijing 2008 silver already around his neck, Seguin was at ease at the Rio 2016 Paralympic Games with sailors and friends from his disabled sailing association watching on Flamengo Beach. Familiarity of those who he holds close to his heart ensured his calm persona remained throughout a testing 11-race series. With an astute, mature performance Seguin concentrated on staying at the front of the fleet and even though he only won one race in the series, he remained in the top six throughout as some of his rivals stuttered. 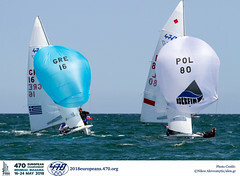 In the final race Seguin sealed the deal when he crossed the line in fourth position in front of the only sailor that could mathematically beat him, Great Britain's Helena Lucas. To excel in the pressure pot of Olympic Laser Radial sailing, an athlete needs confidence, assertiveness and drive, to think of themselves and punish their opponents when the time comes. Marit Bouwmeester of the Netherlands possesses these attributes in abundance and mixed with a thirst for victory the Dutch sailor is one of the most feared competitors around. 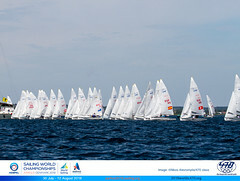 Leading up to Rio 2016 Bouwmeester was dominant in the Laser Radial, continuously pushing for the top step of the podium. Wins on Olympic waters in Brazil, Sailing World Cup Weymouth and Portland and the Delta Lloyd Regatta reflect her winning mentality whilst second and fourth place finish at the 2015 and 2016 World Championships only fuelled her fire for Rio 2016 gold. A steady, consistent series of races gave the London 2012 silver medallist a cushion heading into the Laser Radial Medal Race and in a nail biting, to and fro finale, Bouwmeester confidently crossed the finish line as an Olympic champion. The pursuit of glory can take an athlete down different roads but no matter what, the desire to attain and achieve remains. A two-time Olympian in the Laser Radial, Cecilia Carranza Saroli made the switch to sailing with a partner for the first in her career in 2013, taking to the Nacra 17, before teaming up with Santiago Lange in 2014. At the Rio 2016 Olympic Games, Carranza Saroli beautifully combined the desire for victory with athleticism and skill to give herself and her inspiring partner, Lange, a small advantage heading into the Medal Race. Despite receiving two penalties, Carranza Saroili's never say die attitude shone through in abundance in the Medal Race. Finding that extra ounce of energy and drive, the Argentineans crossed the finish line in sixth to take one of the most emotional gold medals in Olympic history by a single point. The Rio 2016 Olympic Sailing Competition signed off with the 49erFX Medal Race and the golden girls of Brazilian sailing, Martine Grael and Kahena Kunze, delivered in one of the most thrilling Olympic races of all-time. In a script that Hollywood's best would struggle to even come close to, it was a four-way shootout for gold in the Medal Race with the pressure of an expectant partisan crowd watching on Flamengo Beach and the eyes of a nation glued to the TV throughout Brazil. When it looked like Alex Maloney and Molly Meech (NZL) were going to take the honours, Grael and Kunze found an extra edge and on the run to the finish it was neck and neck. As those watching held their breath in anticipation, Grael and Kunze concentrated on keeping the Kiwis at bay and beat them by just two seconds at the finish. A partisan crowd greeted the Brazilians at the beach to capture one of the most iconic images of Rio 2016, highlighting Brazil's passion for sailing and their new starlets. A dress rehearsal for the Olympic Games, sailors who win medals at Olympic Test Events often go on to achieve the ultimate. Charline Picon won gold at the 2014 and 2015 Olympic Test Events and after her triumph in 2015, she said to the waiting press, 'in France we have a saying, it is jamais deux san trois'. Translated into English, 'never two without three', it was almost as if she was predicting, with a calm sense of confidence, that Rio 2016 Olympic gold would be hers. What she couldn't predict was the battle and fight she would have to go through to attain her forecast. 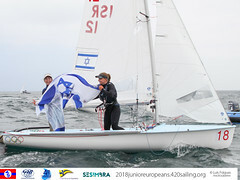 A gruelling 12 races did little to separate the Women's RS:X fleet and six sailors were in with a shot of gold in the Medal Race. Picon was tied for third going into the final race and set out to focus on just achieving a podium spot. As she crossed the line in second she faced an anxious wait to see where her rivals finished. With the main contenders at the back of the pack Picon was correct, you never get two without three and burst into tears of joy as the celebrations commenced.